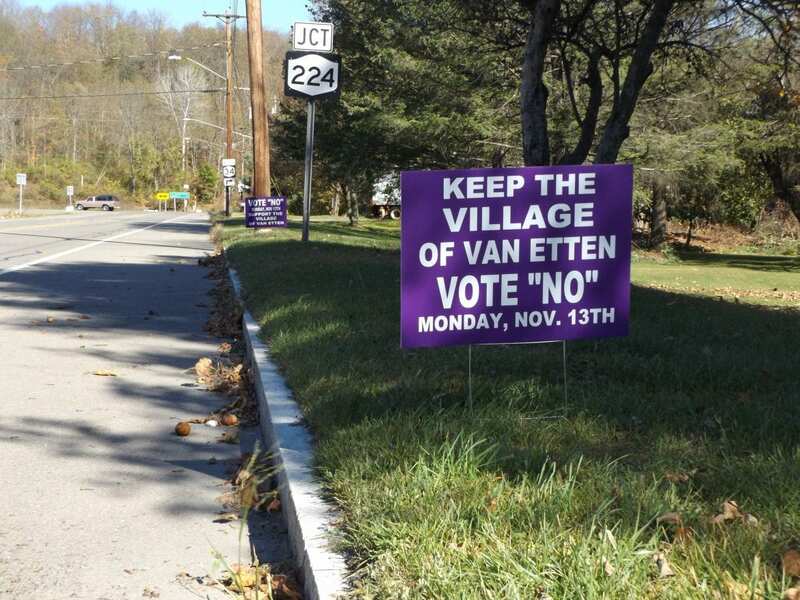 Residents in the Village of Van Etten are split over whether to dissolve their government. They vote on it next week. If yes, the village would be absorbed by the Town of Van Etten, but, the decision is not just about saving money. It’s about a deep rift between the village and town governments. Heather Gable and a small group of people took it upon themselves earlier this year to circulate a petition and bring village dissolution up for a vote. According to data from the New York State Comptroller’s Office in 2015, the most recent data available on the site, the Town of Van Etten had the highest property tax rate in Chemung County at $7.94 per $1,000 of full assessed valuation. No other town was higher than $4.30. The idea of dissolution was brought up at a joint village and town board meeting in April. There’s a state program that encourages communities to consolidate or dissolve. Gable said the village was taking too long to discuss dissolution so she started the petition. After collecting enough signatures, the vote was set. That was supposed to be in November, but due to a clerical error, it was pushed back to December. Some in the village government think there have been more errors than just that. They’re angry about how Gable’s group circulated the petition. Gable said her petition clearly states that it’s for a vote to dissolve. Copy of the top of the petition. Amid all this, the village hired a company to do a report on how much money they could save, but some people had already taken sides. “Before the report even came about they started putting ‘no’ signs all over the place,” said George Keturi, Supervisor for the Town of Van Etten. He’s referring to purple signs with white writing that pepper lawns in the village. “Vote no, vote no, vote no, and I thought ‘well, that’s pretty much a conflict of interest,'” he added. Keturi accuses the village of trying to paint the town as the enemy. The study came out last month and found if the village does dissolve residents would save some money and the town would see a boost from state aid and the village sales tax. On the other side, village residents would lose some autonomy. Saving money is one thing, but there’s a trust issue. What both sides seem to agree on is that there’s been tension for years. Take the fire department. Up until the last decade the village and town shared one. They had a rift and the town created it’s own squad. “There’s been a lot of bad blood since then and I don’t see it getting any better,” said village resident Karen Frick. The issue then is much like the issue now. It’s village versus town. People like Gable see no reason for them to be separate, but people like Mayor Briggs think he and others in the village should have their own government, like they have for more than a century. The dissolution vote is set for Monday, December 11th. If no, dissolution can’t be brought up again for another four years. If it’s yes, a committee will form to discuss how to move forward.